I walked in the door the other night with pizza, 2 kids and my arms full of bags, including my computer, the kids bag from daycare and more. My husband was a few minutes ahead of us and had already gotten the mail. He said "there's ANOTHER (rolling his eyes) package for you, probably quilting". I began to explain that I hadn't ordered anything. I was perplexed as to what it was. So I tore open the envelope. Be still my heart, my Sprinkle of Sunshine is on the front cover! I have been waiting, and waiting and waiting to tell you all that I would have a project in Quiltmaker magazine! I am on the cover. Here's a close up of the runner. 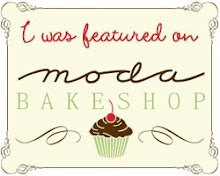 I used Moda's Nature's Notebook by April Cornell to create it. To be honest, I began the project to hand sew during my lunch hour. Bringing a sewing machine to work wasn't a viable option. I've seen many many bloggers starting hexie quilts recently. English paper piecing is one of my favorite quilting methods. I just started a new project last night with a different shape! If hand sewing isn't your thing then this magazine has tons of other great projects. Including designers such as Carrie Nelson of Miss Rosie's, Darlene Zimmerman, Jo Morton and the gals from Quiltmaker. I know I am going to have to get more, one for my mom, my mother-in-law and one each for my girls' keepsake boxes. Okay I must calm down. 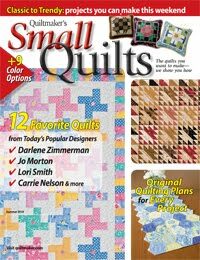 I'll enter you to win your own copy of Quiltmaker's Small Quilts compliments of Creative Crafts Group. Just make sure I can access your blogger profile or have your email available so that I can contact you if you are the winner. I'll pick on May 11th! Congratulations! it looks smashing so I would have picked it for the cover too! Still finding out what which method I like best, when you are starting out there is sooo much to discover! Your tablerunner is great and congrats on making the cover! This looks like a great magazine. I'd love to win a copy. I do like your table runner. I did english paper piecing for the first time a few months back for moda bake shops little challenge, it was fun...I need practice. wow, congratulations, how marvelous! my online quilting bee this month is for some hexagons...they will be my first!! your table runner is divine! I LOVE that runner! I am such a BLUE person!! Hexagons however (cringe) seem really hard! I would love to see a tutorial/pattern on easy curved piecing! I have only tried curves once and lets just say... it wasnt pretty! Congrats on being featured "ON THE COVER" of a quilting mag. I am so happy for you! Thanks for having the giveaway! Count me in! Congratulations on getting on the cover, it is a wonderful piece. I love making small quilts as gifts and would love to win a copy. Congratulations cover girl! Thanks for the giveaway! I do like your tablerunner-what an honor to be in a magazine. I love your runner! Will ago and look for the magazine. I just taught myself EPP so I will definitely make this one some of the hexies I have put together. Congratulations! I would be excited too if I was on the cover of a magazine. Love your table runner. I have lots of blue hexagons already done and now I know what to do with them. Congratulations, Whoo-hoo! Bells are ringing and fireworks are going off. I'm really happy for you. And I love your small quilt. Perfect quilt for the cover of this magazine! What would I like to see....? Let me see...I'm a bag-fun. I'd like to win of course. Thanks for the chance. So great! The tablerunner really looks lovely!Congrats! Would be great to win a copie! Congratulations Vickie! I love Natures Notebook (I made my sister a quilt out of it) and your table runner looks awesome. What would I like to see - another table runner by YOU! Oh Vickie!! I am so thrilled for you - you are GREAT at keeping secrets! I am smiling for you as I type this - Congratulations!! What a thrill it must be to see your own work on the cover of a magazine - woohoo!! I would love to win an autographed copy - I'll auction it off for thousands when you are famous LOL! Congratulations!! That's great. Your hubby sounds like mine when I receive those squishy packages in the mail. Gotta love em. Congrats on the cover. I love your runner. Maybe this can push me over the edge to try paper piecing. I'd like some good pillow ideas. I like to change out my pillows with the seasons. Congratulations on making the cover. Congratulations! I love your little runner. Wow! You're a cover model! well, sorta. I really like the idea of having different types of projects, some for the machine and some for hand. How about a cathedral window project or applique??? of course, with an excellent tutorial that you're know for. Congrats on the cover! So cool, and I do love your runner. I'm still learning, so I'd love to see more simple patterns for quilts. Congratulations ! !Your table runner is lovely and love the fabrics. Ok, I'll say it... I love your runner! The colors are so fresh and summery and I love the hexies even though I don't think I'd ever attempt them ;) What a thrill to be on the cover! Good for you! Would love to win a copy of the magazine...it looks great.. Congrats!! The cover, wow. I'd love to win a copy, and yes your table runner is amazing. Hope this mag re-starts a trend, I miss those old Miniature Quilts and Small Quilts magazines. 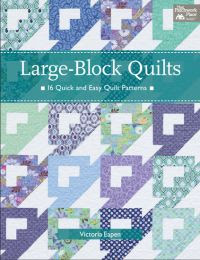 Congratulations--must have been like a dream come true to see your quilting on the cover of a national publication! Also thanks for the opportunity to win the giveaway! Congratulations!!! Now I will have to hunt down the magazine. Will you autograph it for me? LOL!! Congratulations again! And your tablerunner is a beauty. Congrats on being a cover girl! I bet a lot of us out there would like to see some curtain toppers. We have our beds and tables all nice and pretty, so how about those windows too? Congratulations, Vickie...I would be hyperventilating also...what an honor! Your table runner is so cute...have some of that fabric also, love blue and yellow together. 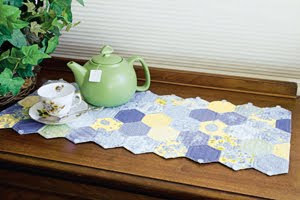 I love that table runner and have been so amazed at the lovely hexagons going on around blog land. Your work is really lovely. Congratulations! How exciting to see your project on the cover! I think your table runner is super cute. I DO love your runner! I too have been hand sewing hexes for a doll quilt, but I might have to think about making it into a table runner! Great job! What a lovely tablerunner and quite an honor to make the cover...congrats! Congrats! Love the runner. I guess I'll finally have to make a hexie quilt. A runner looks like a great size to start with. Congrats! That is very exciting! I love your table runner, and think I should have done something small like that rather then think I was going to make a full size quilt. Wow! Congrats to you!!!! Please enter me in your giveaway. LOVE to do one similar! Congrats, Vickie! Love your table runner and the fabric you used. Congrats on being on the cover. Here's to many more successes. Thanks for the chance! What a cute tablerunner. Thanks for the chance to win. I love your blog. I love your runner...hexagons in great colors! And Congrats for making the cover. I would love a copy. Thanks. I love your runner-and think that sewing hexagons is a blast! Congrats on the cover shot! Congratulations on having your quilt on the Quiltmaker cover!!!!! That is awesome. I do love your tablerunner. I'll start watching the magazine racks for the new magazine. I love small quilts. OOHH!! Congratulaions on the COVER!!! I'm too afraid to start table runners! Everyone will look at them while eating and such. It's my next big "teach me!" Congrats on not only being published, but making the cover!! Yippeeeee!! Happy dance for you!! Congratulations! You are a cover girl!! Your table runner is perfect, love it! Ooh how exciting, congrats covergirl!! I love your table runner, a very deserved spot on the front cover!! You are so lucky to have your piece published. I've love a copy of the magazine. say LOVE it, I do and save a copy of it , the magazine, for me!! I would love to see an article, or articles, on the Civil War Bride Quilt. And, by the way, I love your runner!! I love your runner. I'm really into small, quick projects with bright, cheery colors. Oh yes! Congrats! That's so awesome. What a dream come true for you. LOVE the runner and I will definitely be buying this magazine as I love hand projects!! Thanks for the chance to win the give away!! Congratulations! Your runner is wonderful. What fun to see hexagons in a larger size. Good job!! I love your table runner. I've seen a lot of hexagon quilts lately, but a runner would be the perfect size to try it on. Thanks for the giveaway. Congratulations! I am so happy for you. Can't wait to see the mag. I really do like your table runner - I'd like to try that sometime. Count me in on your drawing - I'd love to spend an afternoon in the magazine! congratulations!! I need to try my hand at making Hexi's! I love all your table runners!! How exciting for you - now it is my turn pick me, me, me. Fantastic News, congrats...I'm running out tonight to buy it! Congratulations, are you doing the happy dance? I love the runner it looks so nice on the table. Congratulations, Vickie, on making the cover! 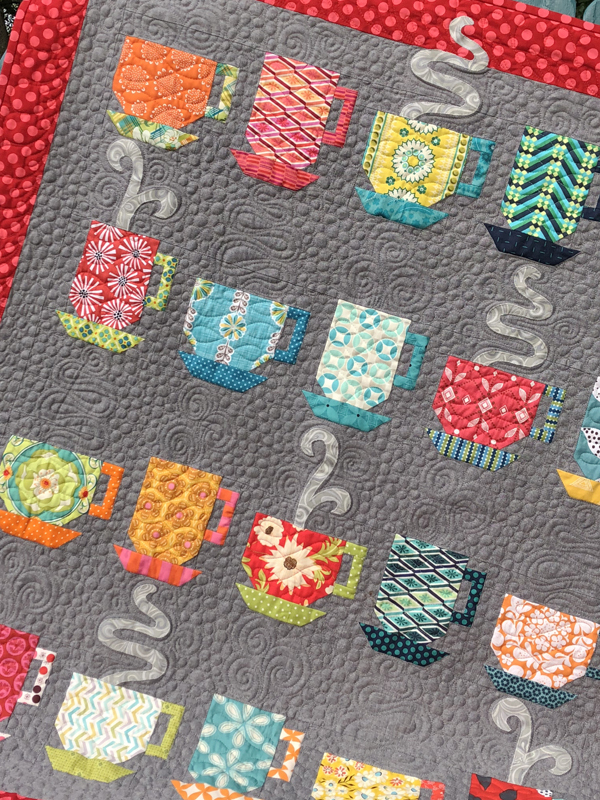 I am a hexagon junkie, how can I not love that beautiful little quilt! I do love your table runner. I really like Nature's Notebook fabric, perfect fabric choice for your table runner. I just read on Carrie's blog about this magazine, I'm thinking I really need to have that magazine. Congrats on getting published, so exciting. 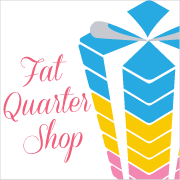 Hmm, projects that I want to see in Quiltmaker, maybe something cute and easy for Christmas gifts. Well, I do love your table runner :-) and if were to pick things to see if future issues, it might be more of your table runners or perhaps placemats or tablecloths. Thanks for the chance to win, I'd really love a copy of this. and Congratulations! congrats, nothing like being a cover girl!!!! of course I LOVE your table runner, would love to make it for my table too. Congratulations on the magazine cover! How exciting for you! It's a great table runner! i love your runner the colors are great! darling Spun Sugar on the cover and Carrie Nelson's description of this issue really got my attention! Congratulations! congratulations on making the cover but then your runner should be on the cover it is beautiful. I've been stalking the magazine racks to find this magazine!! Congrats!! How fun!! Congratulations...what a wonderful honor to be on the cover! I love your runner...maybe I will try hexies...thinkin' on it. That runner is the perfect size project for me to do with hexagons. You rock!! Back for a second look. I am so proud of you. I kep looking for the magazine. Have not seen it on the shelves yet. I will go to the book store next. Congratulations are in order for sure!! Table runner colors are so cool - summer look. Like the hexagons.